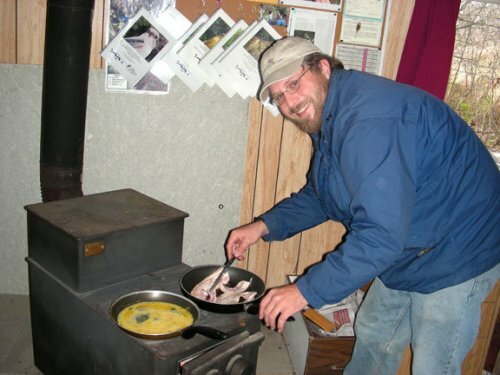 attention to making the most of our wood stove by using it to prepare breakfast! Notes: Our final week of the Fall 2008 migration monitoring season has now officially come to an end. And keeping with this season’s trend, we had our most productive final week ever! Despite net hours being reduced due to rain, snow, cold weather, and high winds, we banded over 200 birds this week, a first for week 13 – and the rate of 76.7 birds banded per 100 net hours is also the best we’ve ever had this late in fall. Giant thanks to all our wonderful volunteers who braved early mornings, mosquitoes, rain, snow, and a distinct lack of caffeine at times, whose assistance made this incredible season possible. Special thanks to James Junda, our wonderful guest star BIC for all his hard work over the past two months – we are sad to see him leave and hope he will return for a visit someday! As well, thanks and congratulations to our newest MBO BIC, Gay Gruner, who has been with us since the very beginning and has been a dedicated bander-in-training for more than a year. She is a fantastic birder and bander, and we are so lucky to have her on our team! We marked another significant milestone this week as we banded our 5000th bird of the fall season – a total we had never previously reached over the course of a full year, let alone a single season. It really was a remarkable fall migration this year, as our previous three season totals had all been rather similar: 3218 birds banded of 78 species in 2005, 3268 of 76 species in 2006, and 2876 of 77 species in 2007. While the number of species banded this fall was in the same range at 77, our final total of 5101 represents a 56% increase beyond our previous high – a result we would never have expected! Of course, absolute numbers can be a bit misleading, as they don’t reflect year-to-year differences in effort and weather. 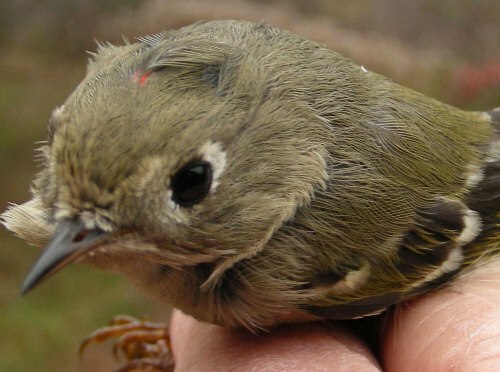 Not only did we band more birds in fall 2008 than ever before, but we also had a record number of net hours. In part, this reflects a growing number of experienced volunteers at MBO, allowing us to minimize net closings as a result of being short-staffed. But at least as significantly, we had excellent weather this fall, with far fewer days lost to rain than in the past. This is why we track effort in terms of net hours, and report a standardized rate of birds banded per 100 net hours that can be compared more fairly over time. The rate of 91.0 birds banded per 100 net hours this fall was indeed also a record, but only slightly better than the rate of 86.4 in fall 2005. That year we lost several potentially good days in later fall to bad weather, and weren’t yet banding daily in August, as we were still setting up and recruiting volunteers at the time – had we been in full operation that year it seems likely we would have had a total of well over 4000 that year. For the first time ever, we passed the 5000 birds banded mark in a single season - and while American Robins and Slate-coloured Juncos dominated this week, it was this male Ruby-crowned Kinglet (with just a hint of red showing) that was #5000. Without question, the story of this fall was the tremendous volume of Yellow-rumped Warblers that peaked in early October, with over 1500 of them banded just during the core three weeks of their migration. Considering that our previous record for this species was 522 individuals in 2006, they alone account for much of this year’s increased total. Although four years is too short a time to make any strong statements about population patterns or trends, it is intriguing that so far we have seen a very distinct two-year cycle in the numbers of this species, with many times more in even-numbered years than odd-numbered years (last year, for example, our season total was just 68!). We have seen complementary trends for other species (e.g. Black-capped Chickadee numbers have so far been spiking reliably in odd-numbered years) and this is something we are eager to explore in more detail over the years to come. One area where the 2008 fall season was actually a bit subpar was in terms of the total number of species observed – 139 this fall, better than 134 in 2006, but well below the 144 in 2007 and the 151 that we saw in our first full fall season in 2005. In large part this was due to a scarcity of waterfowl for reasons unknown. In some past years, Northern Pintail was common enough to rank among the top 10 species observed in some weeks, but this year we didn’t see a single one all season long – and the same holds true for a number of the other less common ducks. In terms of passerines, which are our priority for monitoring, the number of species observed has remained much more consistent from year to year, although the list varies a bit each year in terms of the rarities that don’t occur annually, such as Bicknell’s Thrush, Blue-winged Warbler, Clay-colored Sparrow, and Pine Grosbeak. Although no new species were seen or banded this week, we still had some special sightings. Large flocks of American Robins and twittering Dark-eyed Juncos kept the site and extractors busy this week. Growing flocks of European Starlings were seen almost every day, with an incredible 400+ birds in the neighbouring fields on Sunday. A small family group of 3 Purple Finches were banded on Monday and several days this week Rusty Blackbirds were seen or heard among the groups of Red-winged Blackbirds passing through. A cold, wet and very unpleasant Wednesday census was brightened by a pair of White-winged Crossbills perched atop the spruce trees – though we’ve seen them fly over MBO several times in the past, this is the first time we can recall them stopping over for a rest. On the very last day, a Ruffed Grouse was seen again – new for the site earlier this fall, it has now been seen a few times, suggesting that maybe it is settling down for winter at MBO. Juncos always are among the dominant birds over the final couple of weeks of the fall season, but this year they were especially numerous, with an average of more than a dozen per day banded during the past week. American Robins just beat out the Slate-coloured Junco this week for the top spot of birds banded in week 13. The number of Slate-coloured Juncos was a one-week record, and helped propel them to over 200 for the fall – yes, another species with a record high. This included 39 on the final day of the season – at times like this it’s hard to shut down for winter, as it’s evident that migration is still well underway for at least a few species, but it’s important for standardization that we keep our dates consistent from year to year. We hope that informal censuses and other observations in November will continue to provide us some data about the numbers of these later migrants. Other than the top two species this week, the remaining 11 species banded all occurred in relatively small numbers (i.e. 10 or fewer), with four tied for last place with just one individual each: Black-capped Chickadee, Brown Creeper, Golden-crowned Kinglet, and Red-winged Blackbird. For bird species observed on site, the top spot belongs once again to the American Robin, with Canada Goose slipping down to the number 5 spot with an average of only 80 per day, far below the 1000+ individuals seen daily at this time last year. Red-winged Blackbirds remained in second place this week, while American Crow and European Starling both moved up the list due to the large flocks in the fields most mornings. As in past years, we will maintain some level of monitoring at MBO during the winter, and plan to post updates at least monthly. However, we are already looking forward to our fifth year of spring migration monitoring, which will begin on March 28 with daily censuses, and will as usual expand to full morning observations and daily banding at the start of the fourth week. We look forward to seeing everyone again then, if not sooner! 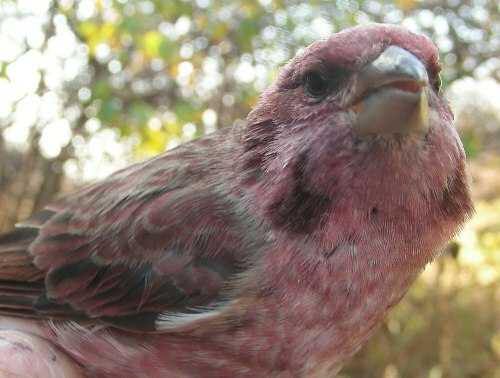 Purple Finches are one of those birds that often look a bit scruffier and less colourful up close than they do at a distance - but nonetheless, we were delighted to get this after-hatch-year male and two others in the nets this week, as they're never a common bird at MBO (only twice before have we banded more than three in a full season in either fall or spring).